by Will Gramling; musician, writer, critic. When fellow concert goers recently told me their latest ticket ventures landed them at the 9:30 Club on May 27th for Paul Simon, jealousy, of course, came first. I mean really, what more could you ask for? A legend like Paul Simon performing at such an intimate venue? “Me and Julio” blasting up to the balcony bar with a cold beer and a 9:30 Club cupcake? Paul Simon, larger than life, close enough to see without a jumbotron? Would it be late evening, smoking weed backstage then cranking up the amp, blowing the room away like the old days? Bummer, indeed. Not to say that I wouldn’t listen to ‘So Beautiful Or So What’ ever again, let’s just say that if Michaelangelo rose from the grave to create a Sistine Chapel follow up, I’d likely still cling to his earlier work. Perhaps artistic reviews should transcend all fan bias, but with an artist like Paul Simon, someone who has shaped this reviewers’ entire perception of what music can be, that would just be impossible. There are certainly shades of the Paul Simon we all know and love in his latest album. In “Love is Eternal Sacred Light” we hear classic Simon metaphors coming through with a constant, uplifting beat that almost has us driving back to Graceland. In this song we get to explore the beginning of time, love and life along the way, and do so by having some fun lyrically, and getting somewhat of a rollercoaster ride musically. In contrast, as is the theme for most of the album, songs like “Questions For the Angels” drag on slowly, touching on what doom there may to come as opposed to what good times may still lie ahead. And not that a song has to be circus-happy in order to grab my attention, it’s just that with songs like this, the lyrics aren’t dazzling enough to grasp your musical soul the way “Still Crazy After These Years” will do even after the 1,000th listen. 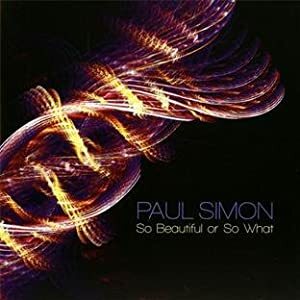 In the end, the lyrics may be my biggest beef with ‘So Beautiful Or So What.’ Paul Simon has such an enormous legacy of lyrics to live up to as one the most dynamic songwriters/poets of the last four decades. In the song “Love and Hard Times,” he says ‘I loved her the first time I saw her, that’s an old songwriting cliché.’ Exactly, as if he’s calling himself out for all of us, and could have just released a new album entitled, ‘Look Guys, What Else Can I Say?’ And with a running time of just over 38 minutes, he really isn’t saying a whole lot. The title track comes last on the album, and I think it sums pretty well. The song is okay at best, and in it Simon says, “Life is what you make of it…so beautiful or so what.” As in, here’s a new album, maybe it’s amazing or maybe it’s just a new album. You decide, but I really don’t care. But it does my heart good to know that Paul is not satisfied to sit on his past accomplishments and is still putting out new music. Like Hall of Famer Joe Morgan at age 40 falling down on the base paths trying to score from 3rd on a sac fly in his last ever appearance in a World Series, Simon risks failure and embarrassment, and exposes himself to unkind comparison's with his own legend. And at a time when when he could easily bask in the glory of sold out stadiums and adoring fans in yet another reunion tour with his old friend (how terriby strange) Art, Paul puts it all out on the line to play his new stuff at the epicenter of the DC hip music scene. his body of work in some perspective, some musicologist will say something like, "panned by the critics and ignored by the public, Simon's ‘So Beautiful Or So What.’ is regarded by many as one of his most melodically interesting works." Probably not, but I think I'll go out and buy his new record, just in case. Well said, well spoken. Have you had a chance to listen to the album yet?